Historians sometime in the future are going to be sorely challenged to describe the post-World War II era. As Alvin Toffler has duly noted, the pace and complexity of change have been accelerated and amplified exponentially in modern times, leaving humanity, like sailors in a gale, hanging on for dear life to whatever they can grasp. Those historians will, no doubt, look to the artefacts we leave behind to try to understand what we are now experiencing. Like other eras, popular music will be one of these artefacts, and music that tells a story will be one of the more valuable sources of understanding. “Bear Claw Bob” Barraclough is a Canadian songwriter, performer and recording artist who started performing in church choirs and school bands when he was a youngster, and went on singing, playing and writing music through a life full of people, places and events that shaped him and his work. Like the majority of North Americans, he has had numerous "careers" over the years, but the thread that has tied all his endeavours together has been his music. A born balladeer, Bob's music tells stories about living through our tumultuous times in a range of genres including folk, pop, rock, country and blues. To support his stylistic wanderlust, he picked up keyboards, percussion, guitar, bass guitar, harmonica and accordion along the way, gathering the tools he needs to mine the diverse inspirational treasures of modern life. When he first began his involvement with popular music he was listening to Buddy Holly, Elvis Presley, Hank Williams, Patsy Cline, Nat King Cole and others on the AM radio, and occasionally visiting the local record store to add a 45 RPM disc to his collection. Later, music became entwined with notions of generational identity and cultural transformation, tapping into earlier voices crying out in the wilderness, such as Leadbelly, Woody Guthrie and Billie Holiday. Musicians were expected to say something meaningful, to shed a light, to act as a beacon to a new and better world. The old world, with its materialism, intolerance, violence became anathema. Entertainment became religion so to speak. In 1964 Bob traded the clarinet his parents had bought him for a guitar and started to learn how to play the music he was hearing on the airwaves and on vinyl. In 1967 he wrote and published his first song "Other Love Than Mine," while a college student and occasional folk performer at Yale University's Exit coffee house. In 1969 he dodged the United States for Canada, where he co-founded Toronto’s Live Bait Band in 1971 and wrote tunes such as "Listen Jack," "Saturday Morning," and "Slowed Down Day." In the 1980's he needed to put food on the table for his young family, so he became a bass player for Muskoka’s Northlanders. 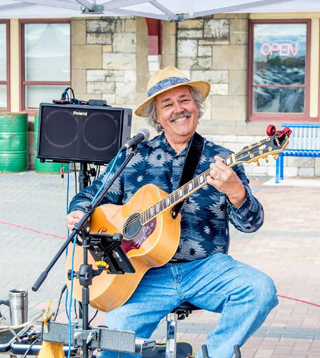 Following sojourns in various parts of Ontario pursuing a career in social work and teaching, Bob moved to Callander, birthplace of the Dionne Quintuplets, and joined up with other musicians from the North Bay area to form the Bear Claw Blues Band. In 2002 he released his first self-produced album of original tunes, "Liberty Town" which featured songs written over the preceding thirty years. Bob's original songs are built around thoughtful, poetic lyrics reflecting voices of some of the most influential poets and songwriters of our times. Whether he is performing one of his own compositions or interpreting another's work, the songs all feature inventive narrative and evocative imagery, woven into spellbinding rhythms and unforgettable melodies, creating scenes that come to life in your mind's eye. 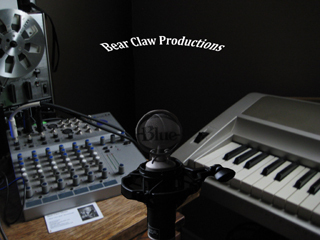 Listening to a Bear Claw Bob song is like reading a short story, or in the case of an album, a novel. You feel like you have been transported someplace unique and inviting, where the world makes some sense, and you will find yourself wanting to go back for more. 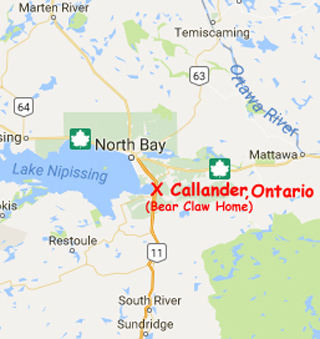 CALLANDER, ONTARIO is 14km south of the City of North Bay on Lake Nipissing's beautiful Callander Bay, home of the greatest sunsets on Planet Earth, people say. Bear Claw Home is just off Highway 11 near the junction with the Trans-Canada Highway (Rt. 17), 125km east of Sudbury, 375 km south of Timmins, 343 km north of Toronto, and 354km west of Ottawa. The North Bay Jack Garland Airport is serviced by Air Canada and Bearskin Airlines for easy connections throughout Ontario and beyond.